Every so often I return to the task of attempting to define engineering and measure engineering effort. A common point of reference for my attempts at defining engineering effort is the article: Edward Yannul (Oct/Nov 2005 ), Engineering World , Volume 15 No. 5, pg 27-29. Each of these factors is divided into a range of 4 levels, and a number rating assigned, the product of all 4 factors determines an overall engineering effort: and this final result is also divided into 4 levels. Noting that I consider engineering takes place at the frontiers of science and technology, and that most design is concerned with established technology, the above methodology is of very little help if everything has engineering effort at level 1. The planning, design and management of established technologies involves little risk, near complete knowledge and near certainty of outcome. The degree of change is low, the technical challenge is low, and strictness of goals whilst may be high more typically involves significant freedom (eg. designer decides acceptance criteria not end-user), and as already mentioned the risk is low. As a consequence I deviated from this approach and looked at Renard series. These are series of preferred numbers typically used for defining ranges of product sizes, and based on a geometric series. They tend to provide small increments in size at the low end of the scale and large increments at the upper end of the scale. 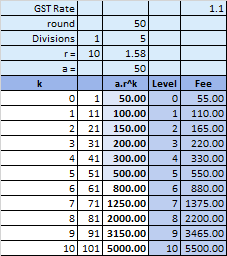 I started with a upper limit fee of $5000 (excluding GST), and then divided this into 10 levels. 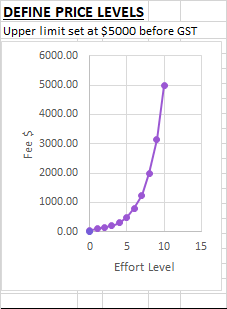 Having now got 10 levels to work with, the next task is assigning the fees to work. If hourly rates are constant, and the only contribution to effort is time, then the only determination of effort level is time. That is the fee allocated to each level can be divided by a constant hourly rate and the hours for the level of effort determined. For projects where the number of hours doesn’t match one of the levels the project is assigned to the nearest appropriate level. That is the project fee is rounded up or down, based on judgement of the specific nature of the project. That is factors beyond time are considered intuitively at the point the time based fee is assigned to an effort level and the fee adjusted accordingly. At such point can also step back to the estimate of hours and adjust the estimates of time up or down where there is uncertainty. An alternative approach to refine the guess work and reduce uncertainty is to calculate and engineering effort, based on multiple factors, starting with a base fee for labour. The base fee for labour could be for example the Australian Federal minimum wage. Separate complexity and risk factors can be multiplied to get an over all engineering effort and this is then multiplied by the federal minimum wage to get the new wage rate. The new wage rate then adjusted by overheads, to get the hourly charge out fee. A project is then costed based on lower and upper estimates of time, then some judgement made, possibly intuitively as to what the actual price should be. More formal probabilistic methods can be used to weight the time estimates. Whilst the more formal methods are more refined at their core the methods are dependent on subjective viewpoints (a guess, a gut feeling). An alternative approach to adjusting the labour rate is to start with a desired labour rate already adjusted for overheads. For example start with a $55/hour charge out fee. Total effort (TE) is then the product of hours, and the engineering effort. Where engineering effort is the product of weighting factors for complexity, risk and any other factors which may be considered important. Alternatively engineering effort (EE) maybe just a single weighting factor determined by judgement. So for example if take $55/hour as the rate including GST, then price level 3 at $220 represents a maximum of 4 hours work at EE=1. But at an EE=2, it represents a maximum of 2 hours work. I have arbitrarily chosen to set EE=2 as the maximum, but it need not be. This is then divided into 11 levels (0 to 10). 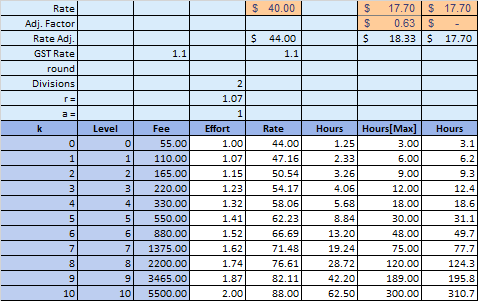 As the chart above shows (in this case with a rate of $44/hour), as move up the levels of engineering effort, the hourly rate increases, and the maximum hours for each price level are based on these adjusted rates. Compare this to the maximum hours determined from uniform labour rate at the federal minimum rate, or the adjusted federal minimum adjusted to set the maximum hours at 300. Consider that some of the large national consultancies are reportedly charging rates of $250/hour. For me, as mentioned above, engineering takes place at the frontiers of science and technology. Real Engineering is a high risk activity, with decisions and actions based on deficient and extremely incomplete knowledge, with uncertain outcomes. Society would collapse if extortionate amounts of money were to be expended to reach a destination with no idea how to get there, and everyone was just bumbling around in the dark. This poses a dilemma. As risk increases “engineers” expect higher incomes, but those footing the bill want to pay less given they are likely to get very little if anything for their investment. It is therefore important to identify this spectrum of technical knowledge required from the simplest trade to the most complex scientific endeavour, and when doing so keep arrogant professional elitism out of the equation. If look at from the educational viewpoint there are 10 levels to the AQF. When moving up from one level to the next, there is supposed to be increase in depth of knowledge, increase in independent thought, and increase in personal responsibility. The framework is also supposed to be properly articulated to increase mobility between the occupations, not just vertically. Taking these 10 levels, can equally define a federal wage structure, based on my series above. Start by setting the federal minimum at AQF-0 (eg. grade 10), then set the maximum pay rate at no more than 2 times the minimum. 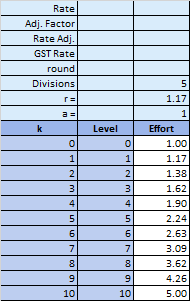 Then generate a preferred series of numbers between 1 and 2, to determine the wage rate at each of the other levels. Alternatively set an upper limit of 5 times. Personally I don’t believe anything higher than 5 times is acceptable. So based on this higher weighting an Associate Technologist (AQF-6) would have a weighting of 2.63 applied to the federal minimum of $18.29 and therefore their rate would be $48.10, whilst an Engineer (AQF-8) with weighting of 5 would have rate of $91.45. These would be rates set by legislation along side the federal minimum. Individuals can make more than these rates but not less. However the rate is not determined by the individuals education but by the weighting of the task at hand. This is important because many of the people with AQF-8 qualifications are employed in work which only really requires AQF-6. By properly weighting engineering effort, we can avoid qualification inflation and avoid stagnating progress. More importantly we can avoid naive legislation like they have in Queensland, Victoria and the states of the USA, which all incorrectly and inappropriately define engineering activity (They seem to have no regard for history and technological development). 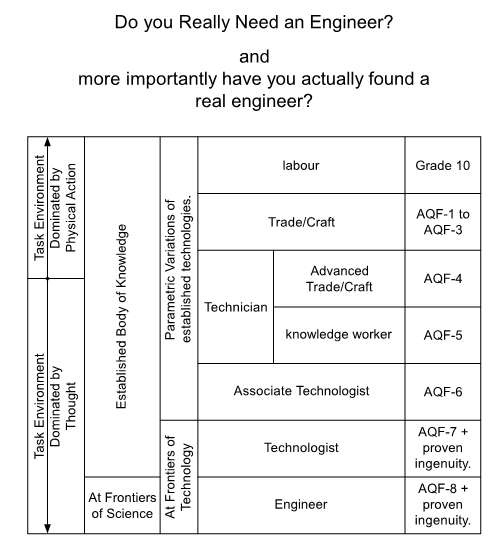 For example the sizing of a beam is within the capabilities of Associate Technologists (AQF-6). Therefore using AQF level as the complexity rating for total effort, and federal minimum wage as the base rate, designing a beam has a TE=2.63 (on a scale of 1 to 5). Buildings, Bridges, cars, aircraft, ships, cranes are all established technologies. The design of established technologies are all largely within the capabilities of 2 year qualified Associate Technologies or 3 year qualified Technologists (AQF-7). To clarify further. The academic workload is expected to between 1500 hours and 1800 hours each year. If depth of knowledge is to increase from one level to the next, then a properly defined award at AQF-8 would have minimum 4*1500=6000 hours of work, and no possibility that the programme can be broken down into smaller independent units. That no subject in the 4th year can be studied without having completed the prior 3 years. If look at occupational degrees this is seldom the case, the degrees are a collection of subjects, many of which are independent of the others: thus different academic programmes and occupations can be defined using the same subject matter: the system is not properly articulated. In the USA, summary information for each branch of engineering, examined by the National Council of Examiners for Engineering and Surveying (NCEES) , typically indicate that each branch comprises of at least 5 major areas of practice. So accepting that no individual strand of knowledge extends to workload of 6000 hours, consider breaking into 5 independent strands. In which case length of strand would be 1200 hours, which being less than 1500 hours means it would fit in a one year programme, and thus the B.Eng is little more than 5 separate programmes tacked together. With each programme being at the level of AQF-5 or are they? In order to determine if the programmes are at AQF-5 requires putting aside occupational elitism. Just because an academic programme is spread across multiple years doesn’t mean it needs to be or should be. Applied and Technical mathematics is the fundamental basis of most the engineering effort. Assuming that grade 10 level of education in mathematics is AQF-0, and that AQF-5 is one year duration and split into into 5 stages, such that AQF-1 is 1/5th of a year, and AQF-4 is 4/5th of a year. Then rough guess, assuming typically, only have 5 major subjects at grade 11 and grade 12, then education in mathematics upto grade 12 only reaches to AQF-2. Further education in mathematics at university level for a B.Eng, only adds maybe another 2/5ths of a year. So a total of 4/5ths of a year in mathematics or AQF-4. Assuming that this mathematics is a prerequisite for most of the science subjects, then a minimum academic programme, would be around 2 years, or AQF-5 plus one year (AQF-6). So do the mathematicians spend 3 years (AQF-7) studying a single subject in depth? The critical point is that we can reprogramme much of our occupational qualifications and educate people to do the work which requires doing in less than 2 years instead of wasting 4 years imposed by the occupational elitism of professional cults. It should also be understood that the typical 4 year B.Eng programme has very little coverage of the technical knowledge required to be adequately conversant in the established technologies. Thus we rely on industry to teach a graduate of civil engineering how to design buildings or storm water drainage systems. Typically they would only get on the job training in one of these areas, therefore the 4 year programme is wasteful. By being more specific about the areas of practice and the work which needs to be done, both education and training can be better matched to the needs of society. If we eliminate the technical mathematics and the technical science not relevant to a specific area of practice, then instead of a 2 year programme in technical science and mathematics, we can develop a 2 year programme in a specific area of practice such as storm water drainage or building structures. Alternatively if we stick to an AQF-6 qualification in technical science and mathematics. We could create an AQF-7 qualification in the specific area of practice. Not recommended however because it would not be properly articulated and would be misleading about depth of knowledge. Assuming the AQF-6 qualification contains a maximum of 5 strands, none of those strands would extend to a depth requiring 3 years of study. The dependent science, mathematics and its specific application could be programmed (scheduled) in 1 to 2 years. I believe it is far better for mobility in the workforce to identify breadth, than misleadingly identifying depth catering to the desired status of professional cults. Catering to breadth, people would have multiple AQF-6 qualifications. With an AQF-5 qualification in technical science and technical mathematics, which grants them entry to the AQF-6 programmes. Taking this into consideration then the planning, design and management of established technologies only requires AQF-6 level of education, and an engineering effort at level 6. At level 6 the engineering effort is taken to be 2.63 (on a 1 to 5 scale) or 1.52 (on a 1 to 2 scale). Using the AQF this way only considers one aspect of complexity, and that is required knowledge and understanding. Another aspect to complexity is the seemingly chaotic order of large assemblies and systems. This may be covered by size or scale factors, along with factors for repetition. A system may at first seem complex, but actually break down into repeated simple units. In other cases the repeated unit is complex, but its relationship to other units is simple. The point however is that if we are dealing with established technologies like storm water drainage system, then this weeks project is little different than last weeks project. That is we know how to design it, we know what is required, and we know how to reach the destination. The size of the system maybe different, the input data maybe different, the results maybe different, but the journey taken is very similar to that taken on all previous projects. If we bring computers into the picture, then we can probably enable and empower the public at large to plan, design and manage the technologies they need and/or desire, and they would only need to have completed grade 10 (AQF-0). However the computers need to be programmed and the knowledge required at AQF-6 would still be required for such purpose. Well actually the programming can be done by those with less than AQF-6, the programs however would need designing and formulating by those with AQF-6 qualifications. Factors and weightings beyond complexity (Technical Challenge), I will consider at a later date. At the moment it’s enough to know that can have a single weighting factor for engineering effort, which is selected by judgement, or this factor can be built up from smaller more specific weighting factors each of which is typically determined by judgement.